The top 10 equine dental problems and how to correct them. Veterinarian Dr. Dennis Rach has long considered dentistry a vital element of horse health care. In practice for nearly 50 years and a partner at Moore Equine Veterinary Centre in Calgary, AB, Rach isn’t only a renowned dentistry expert, he also invented the PowerFloat™ which mechanized floating, making rasping and filing horses’ teeth easier for veterinarians worldwide. 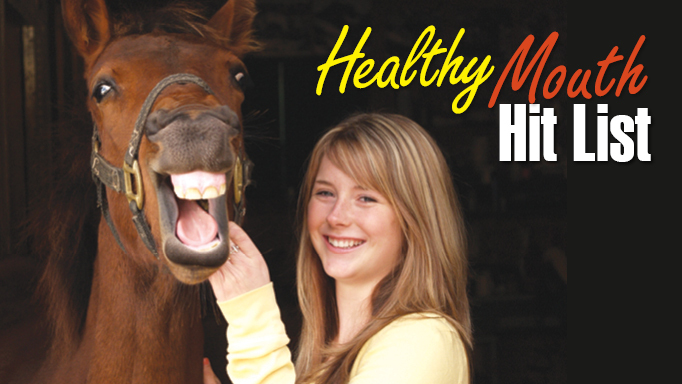 Horse Sport recently asked Rach to list the top 10 dental issues he’s observed over decades of examining equine teeth. Rach calls sharp enamel points “the number-one reason for floating teeth.” Horses have developed hypsodont teeth, about 10 centimetres long, that erupt continuously from the gum to compensate for wear from the near-constant action of chewing. The lower jaw is narrower than the upper to facilitate grinding of tough forage into digestible bits as the horse chews in a sideways circular movement. The points cause cheek cuts and abrasions at the back of the mouth. Points also occur on the inside of the lower teeth against the tongue, but aren’t usually as severe, because the ridges aren’t as high and the tongue can yield more than the cheek. The Fix: Points usually need to be floated (filed down) once a year – one reason why dental checkups should be scheduled annually or every six months for older horses and those in competition “because the bridle pushes the cheeks in against the sharp points and then you have resistance,” says Rach. “In a reasonable number of horses [especially those with parrot-mouth] there’s a tendency for the top row of teeth to override the lower row,” says Rach. This “overjet” results in hooks on the upper front cheek teeth. Because the affected tooth is partly unopposed, a section is worn away while the rest of the tooth continues to grow into a sharp protrusion that can dig painfully into the opposite gum and block the action of the chewing cycle. Mechanized floats make quick work of removing hooks and don’t require sedation or anesthesia, as do molar cutters. It’s especially important to correct back hooks in working horses. “When the head goes into a frame, there’s a tendency for the mandible to move forward just a little bit. That lower hook will prevent it from actually moving forward. The horse might feel that little bit of resistance and might fight the rider,” says Rach. The Fix: Same as for upper front hooks. Two little enamel bumps on each of the cheek teeth, called transverse ridges, help grind food. Rach describes them as “smooth rooftops on the surface of the tooth.” However, when a horse isn’t chewing properly for some reason, the “ridges get steeper like a roof peak on a house.” These excessive transverse ridges restrict movement of the jaw during the chewing cycle, may cause extra wear on the opposite cheek teeth, and can even force two teeth apart, potentially resulting in gum disease. 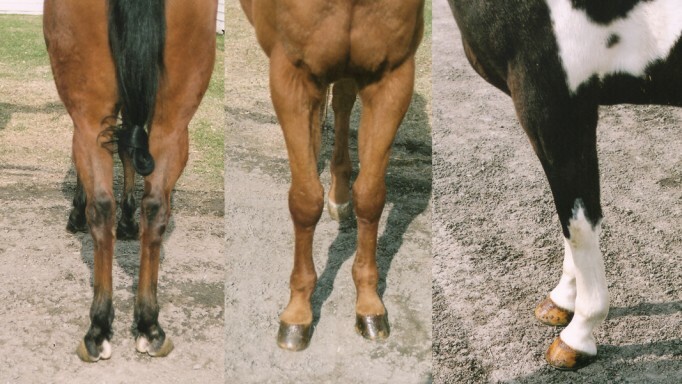 It can also cause problems when a horse is working in flexion. The Fix: Smoothing the ridges down to a normal level via floating – which may have to be done over several sessions – “releases the mouth and the friction,” explains Rach. When you’re peering at the lower cheek teeth and they appear level except for a “bump” along the surface, the horse has wave mouth, says Rach. The Fix: It’s important to begin correction by floating when the horse is young to prevent the situation from worsening as they age and promoting proper grinding of food. In most horses, but not all, small wolf teeth erupt between five and 12 months of age. “The wolf tooth used to be a fighting tooth. It’s now a remnant; it’s short and has small roots,” says Rach. Originally the first pre-molar, they’re found on the upper jaw in front of the first cheek tooth. Often, due to their short roots, they’ll fall out alongside the first cap when it’s shed. Remaining wolf teeth can become an issue for horses wearing bits, however. “Say the horse lunges forward and the bit happens to hit the wolf tooth, it will loosen it a little and the horse will get quite resentful,” said Rach. The Fix:“When we’re doing dental [exams], we just take the wolf tooth out. Then we know there won’t be a problem.” There is some debate as to whether wolf teeth should be removed as a matter of course. “My answer to that is, I’ve never seen any harm done by taking one out, so take it out,” says Rach. Tooth loss is common in older horses as the remaining amount of eruptable tooth diminishes. (By the time a horse is 30, his teeth are worn to just a couple of centimetres in length.) It’s a more serious problem for younger horses. “Horses are pretty nosy, so they’ll often get booted in the mouth and lose one of their front teeth when they’re younger. Or foals will grab onto something like the edge of a fence and something spooks them and they’ll pull back, knocking out one of their baby teeth,” says Rach. If the underlying developing permanent tooth (bud) is damaged, it may not form properly, or fail to develop at all. It also might erupt at a different rate than the opposing tooth, which will grow into the hole, creating an uneven chewing surface. The Fix: “Wherever the hole is, the opposing tooth will erupt into it. It’s a minor problem that’s easy to look after if you keep everything level.” He adds that levelling (reduction) should be gradual so the veterinarian doesn’t remove too much tooth material at one time. Beneath the chewing (occlusal) surface are pulp horns which contain nerves, blood vessels and soft tissue, which can become infected if exposed to oral bacteria. For safety purposes, most reductions are limited to 3 or 4 mm. For that reason, cutters should not be used. Carbide or diamond burrs allow a gradual, controlled reduction. After 3 1/2 months a further reduction can be done, because odontoblastic cells at the top of the pulp horns have laid down fresh dentin. A sagittal fracture is a lengthwise split or slab going up the tooth. Most common in the first and second upper molars, external trauma such as kicks, biting hard objects, and cribbing are usually to blame. Occasionally it’s an emergency situation where the tooth is digging into the side of the cheek, “but lots of times, we’re just doing a routine dental and we’ll see a slab fracture that we have to take care of,” says Rach. The Fix: The fractured pieces are removed and sharp edges floated. If necessary, the tooth is extracted. If plaque isn’t removed, periodontal (gum) disease can set in, causing bleeding, discomfort, and even tooth loss. 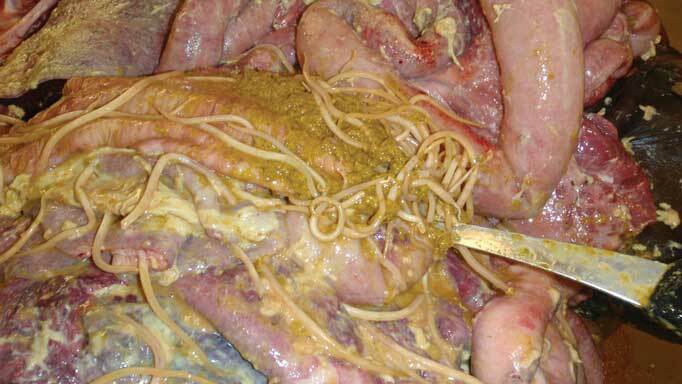 Decaying feed packed in between the teeth causes bacteria to proliferate and inflame supportive tissues. 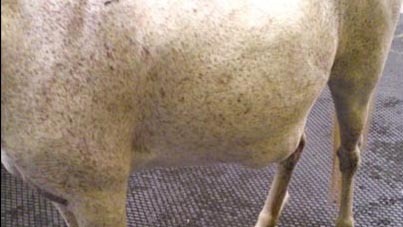 The Fix: Your equine dentist can remove the plaque using scraping tools or a high-pressure stream of prophy powder mixed with antiseptic dental solution. In a few stubborn plaque cases, Rach has also shown owners how to use a soft toothbrush and a germicidal mouthwash every week or two to prevent accumulation. One of the first signs of EOTRH is a reluctance of the horse to accept treats such as apples and carrots, as well as head-shaking, excessive salivation, bit sensitivity, and weight loss. The Fix: “We don’t know the cause, and we don’t currently have a treatment that’s effective except to remove the affected teeth,” says Rach.